Choosing an Android phone for low vision – Part 3: Brand and Android version. | 22 Point Blog! « Choosing an Android phone for low vision – Part 2: Display Technology and Resolution. Android 4.2 has a great magnifier but isn’t available on many phones yet, otherwise version / brand don’t make much difference for large print. Android version 4.2 – JellyBean (Android 4.1 was also called JellyBean), the newest version at the time of writing, includes a full screen magnifier (it enlarges everything but you only see a part of the screen at once) After activating it in the accessibility settings, you can turn it on and off by triple tapping anywhere on the screen. This is extremely helpful as there are many apps you may really want to use where there just isn’t a larger font alternative. If you are a quick typist, it can be easy to accidentally turn on or off. I use a full screen magnifier on my PC at around 3x on a 24” screen, however I find it harder to get used to using one regularly on my phone. While on the computer, I am already using the mouse / keyboard, and the view follows that, on the phone, it’s a much smaller screen and you need to specifically get your fingers in the way to swipe with two fingers to move the view. I think the best solution is if you can have the whole phone setup in large print, with the magnifier as a backup – Other large print apps will be the subject of future posts here. 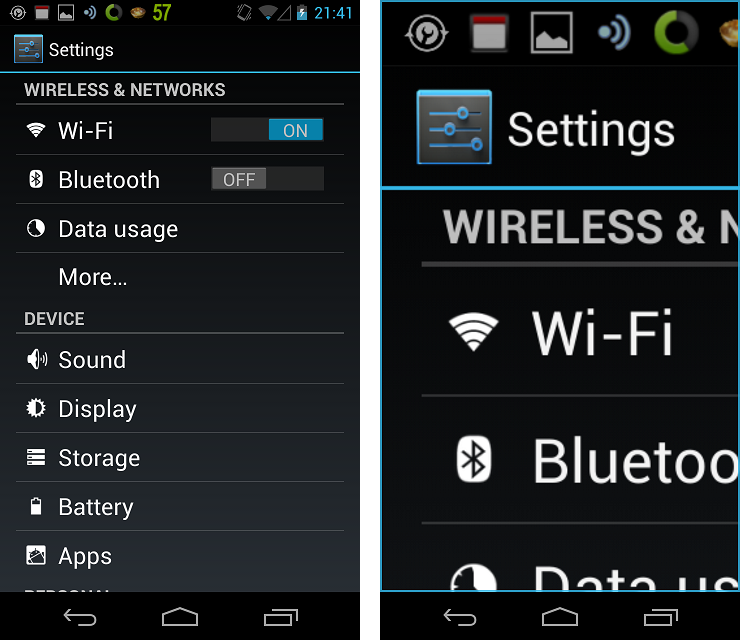 Settings screen unmagnified (left) and with the magnifier enabled at around 2.5x (right). If you use Talkback (screen reader), you really need Android 4.1 or later. Android 4.0+ (Ice Cream Sandwich) has an accessibility setting called “Text Size” which offers a range from ‘Tiny’ to ‘Huge’. Very disappointingly ‘Huge’ is actually only about 2pt larger than the standard size was previously, and Tiny is much smaller. It makes a slight improvement in some stock apps like the play store, but no third party apps that I’ve noticed. At the time of writing this, Android 4.2 is only on 4% of devices but more new devices will start to come with it and some older ones will receive the update. I hear my current favourite phone, the Galaxy Note II, will get 4.2 (it now has 4.1.2) but when buying a phone, don’t count on it getting any upgrades – if you really want the magnifier, make sure you buy a phone with 4.2. Most manufacturers (HTC, Samsung, Motorola etc) modify the launcher (interface) and not all of them work well with Talkback. I haven’t come across any with any real large print options. You can replace the launcher with one which has large print and works with Talkback, I’ll cover this in my next post. If you can get a phone with 4.2, the full screen magnifier is very handy. If you need Talkback, you need at least 4.1, otherwise Android version & phone brand doesn’t have much impact on large print accessibility.